Minnesota students got rowdy when their men's hockey team won a thrilling semifinal match Thursday night, and university president Eric Kaler warned students not to repeat their stupid behavior for the Golden Gophers' final against Union. Even though Minnesota lost, Kaler's email didn't work. 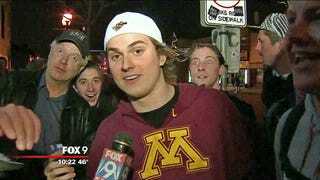 Drunk students—and at least one old guy who enjoys making faces into TV cameras—gathered in the streets of Dinkytown, reportedly jumping on cars, throwing bottles, and being general assholes. At least 19 people were arrested, according to police. A group of students laid down in the middle of the street as some sort of demonstration. (They also chanted "U-S-A!") The assembly did not work. Eventually, police in riot gear used their lethal weapons, and the crowds dispersed. There was also a helicopter at some point, too. Not all of the people walking the streets were there to riot. Some wanted to use their phones to observe idiots, and because of them, we have these photos and videos. Many a selfie was taken last night in Dinkytown. Yes, that is a kid taking a selfie on the roof of a smashed car.